Campus anti-Israel activists copy many of their arguments from two main sources – MIT professor Noam Chomsky, and his acolyte Norman Finkelstein, a DePaul University political science professor who never misses an opportunity to inform readers that his parents were Holocaust survivors. For example, following the Palestine Solidarity Movement’s conference in October 2004 at Duke University, the student paper published a column that included anti-Semitic slurs such as “Jews must own up to their privilege in America, and use it more wisely” and “ ‘the Holocaust Industry’ uses its influence to stifle...the Israeli-Palestinian debate.” The student supported these canards by citing Finkelstein's book The Holocaust Industry. In his controversial book The Holocaust Industry, Finkelstein argues that “Jewish elites” have created an “industry” to perpetuate the memory of the Holocaust as a ploy to extort money and to gain influence, as well a tactic “to crush any dissent, any criticism, of the State of Israel.” The New York Times’ review of the book described its premise as a “novel variation” of the Protocols of the Elders of Zion, the fraudulent essay concocted in the late nineteenth century by the Czarist secret police which purports to uncover a Jewish conspiracy to take over the world. Accordingly, the Times’ reviewer described Finkelstein as “juvenile,” “arrogant,” and “stupid” (Aug. 6, 2000). In Finkelstein's portrayal no one “unerringly articulates” the Holocaust “dogma” more than Nobel Laureate and human rights activist Elie Wiesel, who is himself a Holocaust survivor. Finkelstein mockingly describes Wiesel as the “resident clown,” and charges he is responsible for creating a “meaningless version of the Nazi Holocaust” and for only exposing “genocides that serve the interest of the US and Israel” (Salon.com, Aug. 30, 2000). While Wiesel’s work on behalf of those suffering around the world is generally well-respected, Finkelstein denounces his lack of “humanitarian commitments,” and his “shameful record of apologetics on behalf of Israel.” A more mainstream view was expressed by Ted Koppel of ABC’s Nightline, who called Wiesel “one of the most compassionate human beings alive.” Koppel specifically praises Wiesel for showing as much compassion for other people as he does the Jews (April18, 2002). Other Jewish leaders are similarly slandered by Finkelstein. For example, he calls Abraham Foxman, who heads the Anti-Defamation League, “the Grand Wizard,” a term typically reserved for a leader in the racist Ku Klux Klan. Israel now becomes the United States' strategic asset in the Middle East. It's safe to be pro-Israel. And suddenly American Jewry, Jewish intellectuals and so forth, become fanatical towards the State of Israel. It's one of the enduring ironies of the whole conflict. That of all the Jewish intellectuals who are now fanatical stalwarts of the State of Israel, until 1967 there were only two public Jewish intellectuals who are publicly identified as supporting Israel. There are only two. And they were Hannah Arendt ... the second one was Noam Chomsky. Finkelstein's assertions are simply bizarre. In fact, many Jewish intellectuals supported the Jewish state before 1967.
not only as a Jew. But as one who believes in the wisdom of the policy embodied in the Palestine Mandate for the establishment of a Jewish National Home in Palestine. What is very striking is everyone says, everyone says Israel played no role in my life up until '67. . . . Take the editor of Commentary Norman Podhoretz. . . . He writes a famous memoir called Making It. I reread Making It. Israel gets exactly four words in the whole book, it's nothing. Failing active restraint by America, the Arabs will continue to provoke, and Israel, under the inalienable right of self-preservation, will be forced to move. It is in the interest of the United States to insure that justice is to be done to Israel, and American Jews, who should be alerted by their interest as Jews to the special danger of the situation in the Middle East. . . are the ones to make that point clear to their fellow Americans. Support for Zionism by such luminaries as Brandeis, Franfurter, Einstein, and Podhoretz, all apparently missed by Finkelstein, exposes his shoddy research and proves just how unreliable he is when it comes to Zionism and its history. Just as inaccurate as the Holocaust Industry is Finkelstein’s book Image and Reality of the Israel-Palestine Conflict. Dedicated to the proposition that Israel and Zionism are illegitimate, the book relies largely on anti-Israeli secondary sources and virtually ignores contrary evidence. [a return] is out of the question until we sit together beside a [peace conference] table...and they will respect us to the degree that we respect them and I doubt whether they deserve respect as we do. Because, nonetheless, we did not flee en masse. [And] so far no Arab Einstein has arisen and [they] have not created what we have built in this country and [they] have not fought as we are fighting...We are dealing with a collective murderer. Finkelstein routinely compares Israelis with Nazis and told the Jeruslem Post that he “can’t imagine why Israel’s apologists would be offended by the comparison” (Aug 28, 2000). Al Manar’s expressed mission is to wage “psychological warfare against the Zionist enemy.” Al Manar producers boast of creating programming to recruit Palestinian suicide bombers. In addition, Ibrahim Mussawi, director of English-language news for al Manar, in an interview with the New Yorker’s Jeffrey Goldberg, labeled Jews “a lesion on the forehead of history.” Al Manar TV was banned by European Union satellites for airing racist programming such as the series “The Diaspora” based on The Protocols. 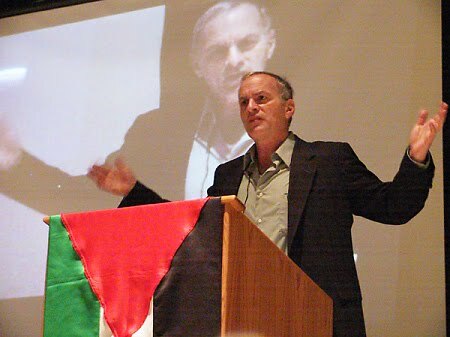 Finkelstein routinely calls those he disagrees with “frauds” labeling their work “hoaxes.” Alan Dershowitz, a renowned Harvard lawyer and author of the best selling book The Case for Israel, is his latest target. Finkelstein claims Dershowitz’s book is “sheer, unadulterated, complete, total, comprehensive, from beginning to end, from the first uppercase letter to the last period, a complete fraud” (March 8, 2005, lecture at the University of Illinois Law School). He accuses Dershowitz of plagiarism and has said that Dershowitz “almost certainly didn’t write the book and perhaps didn’t even read it prior to publication.” The allegations were investigated and rejected by former Harvard President Derek Bok. In an upcoming book on the Arab-Israeli conflict, Finkelstein was going to accuse Dershowitz of plagiarism, but, under threat of lawsuit, he was forced to omit the allegation from his book. Finkelstein going all over campuses of the world making up stories about them. The whole Finkelstein-Noam Chomsky-Alex Cockburn attack team has succeeded in intimidating many young professors around the country and around the world. Because if you write a pro-Israel article or book, they will call you a plagiarist...They will make up quotes about you...The hit team claims that they already prevented and destroyed the reputations of two pro-Israel writers. It’s hardly surprising that Finkelstein’s fabrications and attack strategy intimidate. All the more reason that the facts about his reckless charges be widely disseminated. Finally, the grossly flawed writings of the DePaul “professor” point to yet another example of the failure of the academic world to uphold genuine standards of scholarship–such as accuracy, truthfulness and rigorous sourcing.